What is the fine dual bristle system?Protect Yourself from Bleeding Gums, Tooth Loss, Heart Attacks and Many Other Serious Consequences of Gum (Periodontal) Disease! The Softer, Longer and Thinner Bristles of the Flossing Toothbrush effectively remove invisible bacteria and plaque between teeth and below the gum line ensuring not only healthy gums and teeth but also fresh breath and overall oral hygiene. Shorter and Thicker Bristles perform regular brushing of the surface of your teeth. They are gentle on gums and teeth. 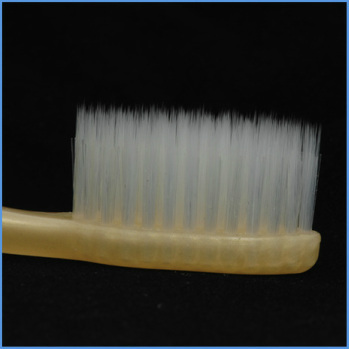 Polished bristle ends prevent injury to gums and the skin lining your teeth. Revolutionary and Patented! (SOFT Bristles Only as Highly Recommended by Dentists and Hygienists To Ensure Healthy Gums and the Optimum Oral Health!) 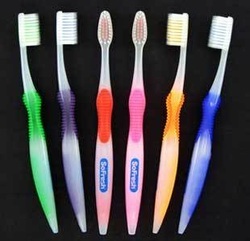 Double-Tiered Bristles "Brush & Floss At Once!" The Flossing Toothbrush was created to provide you with the most effective and safest brushing and flossing experience possible. The Flossing Toothbrush's patented double-tiered, dual-action bristles is the heart and soul of the Flossing Toothbrush. The Softer, Longer and Thinner Bristles of the Flossing Toothbrusheffectively penetrate deep between teeth and under gums removing invisible bacteria and plaque ensuring not only healthy gums and teeth but also fresh breath and overall oral hygiene.Although the SoFresh Flossing Toothbrush does not replace flossing, it greatly enhances your normal daily flossing effort. 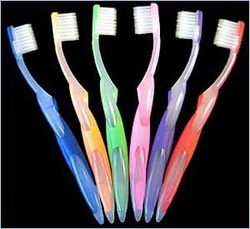 Kid's Flossing Toothbrushes(Soft Bristles Only as Highly Recommended by Dentists & Hygienists!) Ages 4+ Help Your Children Brush & Floss At Once At An Early Age to Enjoy the Optimum Dental Hygiene for the Rest of Their Lives! The SoFresh Kid's Flossing Toothbrush was created to provide your child with the most effective and safest brushing and flossing experience possible. The SoFresh Kid's Flossing Toothbrush's patented double-tiered, dual-action bristles is theheart and soul of the Flossing Toothbrushes.